The Tomb of Semiramis: Now Available! Talk about an early Yule gift; Createspace saw fit to finally accept and process this submission two months later; I have to assume whoever had it on hold quit their job or there was a glitch in the system. 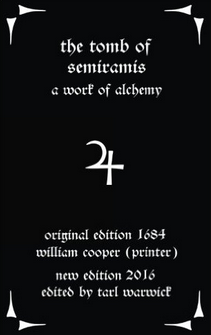 This short work is alchemical in nature; it appears to adapt and retell “A Work of Saturn” by Hollandus and describes the crafting and augmenting of the philosophers’ stone to create elixir- a sort of metallic substance that melts like wax at low heat (or in contact with silver) and can be dissolved in wine or injected into wounds- that this substance is a sort of mercurial compound renders it perhaps less favorable in modern medicine, although I suppose it could destroy infections. Previous Previous post: The Language of the Stars: Now Available! Next Next post: Six Keys of Eudoxus: Now Available!